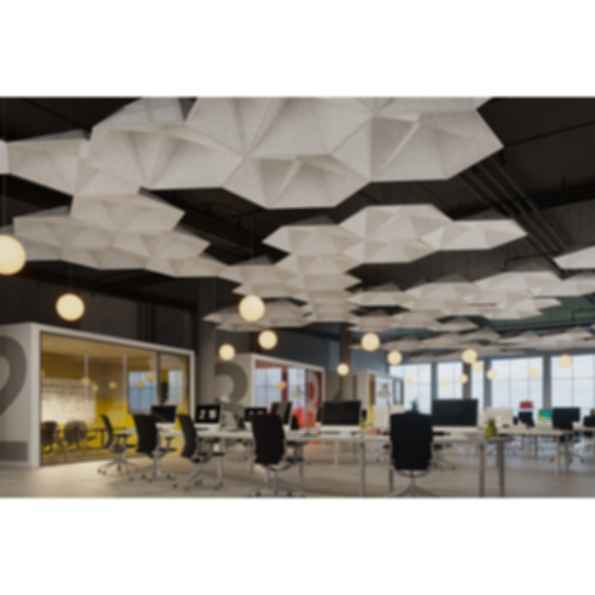 SoundStar® ceiling system's hexagonally shaped cellular coffers offer a scalable way to add geometric dimensionality and disrupt sound's ability to travel across a space. Each module is comprised of angled surfaces made from our Soft Sound® acoustical material (100% PET plastic with up to 60% recycled content) with a metal substructure. Choose from 12" or 24" deep modules, to mix and match as desired. Thanks to its flexible, modular configuration, SoundStar® can adapt to a range of spaces and design visions, to create a spectacular visual effect. The design and sound capturing capabilities of this system offer a fresh effective approach to high performance sound attenuation.